At the beginning of creation, Krishna spoke the knowledge of the Vedas, which guides souls on the journey of life and ultimately back to their spiritual home. From time to time that knowledge becomes diluted or changed. 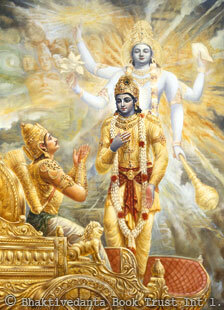 To revive it, Krishna came to this world 5,000 years ago and spoke Bhagavad-gita to His friend Arjuna. The Gita contains detailed teachings on the supreme, infinite soul (God), the finite souls, karma (work in this world), time, and creation. After Krishna left this world Vyasadeva compiled Srimad-Bhagavatam, from the ancient oral tradition originating from Krishna. The Srimad-Bhagavatam is a treatise of 18,000 verses, explaining in detail the science of God. Five hundred years ago, Krishna came again, this time in the guise of His own devotee as Sri Chaitanya Mahaprabhu. He taught that the easiest method for returning to God is to chant His holy names, especially by chanting the maha-mantra: Hare Krishna, Hare Krishna, Krishna Krishna, Hare Hare/ Hare Rama, Hare Rama, Rama Rama, Hare Hare. By His life, Sri Krishna Chaitanya demonstrated how a devotee of Krishna lives in this world and progresses to the next. Bhagavad-gita, Srimad-Bhagavatam, and the teachings of Sri Chaitanya Mahaprabhu form the core of the Bhakti teachings, the essence of which is to return to our relationship with God and live with Him eternally.